If the events of last week were a test, the Emory community failed. The Editorial Board is disappointed that the already polarizing issue of Israel-Palestine relations has become more divided. The Emory community has been unable to engage in civil discussion and has succumbed to the pressure of uninformed student groups and biased, provocative media sources. This is a learning moment, and the University must not let the end of Israel Week and Israeli Apartheid Week end the conversation. Emory Students for Justice in Palestine (ESJP) brought to the forefront the issue of home demolitions in Israeli-occupied Palestinian territory. The Israeli-Palestinian conflict is a contentious subject, but Emory students should be encouraged and have the capacity to engage in nuanced debates concerning polemic issues. According to the International Holocaust Remembrance Alliance, “criticism of Israel similar to that leveled against any other country cannot be regarded as anti-Semitic.” By that definition, the words on the ESJP flyers are not anti-Semitic. But it is important to recognize that ESJP alienated a portion of Emory’s student body with their tactics, regardless of their intent. By posting the mock eviction notices directly onto students’ doors, ESJP violated Campus Life policies, and right-wing media bolstered the perception that students were targeted for their religious beliefs, a rumor disseminated by various groups and individuals on campus. Students who have Jewish symbols on their doors were right to feel upset when they found the flyers. The impression that they were targeted for their religious beliefs was understandable but has not yet been supported by evidence. ESJP also waited to issue a statement until April 5, three days after posting the flyers. The delayed statement enabled campus organizations and the media to create a narrative without incorporating ESJP’s perspective. Controversy and protest often go hand in hand, and shock-value tactics are sometimes necessary to coax students to confront contentious issues. In this case, ESJP appeared woefully underprepared to handle the repercussions of their actions, allowing pro-Israel student groups and outside organizations to frame the protests in a way that avoided discussion of the actual issues they hoped to address. During Israeli Apartheid Week, ESJP hosted multiple discussion events on Israeli-Palestinian affairs, but those hoping for genuine interaction with ESJP may have been put off by the group’s call for a boycott of some Jewish organizations on campus in response to the backlash, including Emory Chabad. Boycotts against Jewish organizations are not the solution. That being said, the under-informed reactions of on-campus student organizations unnecessarily inflamed the issue. Emory Hillel was one of the first organizations to release a public statement addressing the flyers. In their April 2 email, Hillel objectively presented the facts, writing that “there has been no evidence that Jewish students were specifically targeted in the distribution of these flyers.” Hillel’s response constituted a reasonableness not demonstrated by other organizations. Under the heading “Condemning Anti-Semitism and Anti-Israel Activity at Emory,” Emory Eagles for Israel published a statement decrying ESJP’s actions, writing that they were saddened by attempts to “provoke and intimidate Pro-Israel students.” The statement conflates anti-Semitism with criticism of Israel’s government. Such declarations delegitimize atrocious, veritable acts of anti-Semitism. Emory-Israel Public Affairs Committee’s statement that the eviction notices brought “psychological harm” and were “unwarranted, emotionally-damaging invasions of property” dramatizes the event and attacks students’ right to controversial free speech. ESJP’s actions were politically motivated, and SJP is a national organization supported by American Muslims for Palestine, which advocates for pro-Palestine legislation including the Boycott, Divestment and Sanctions movement against Israel’s government. It is important to recognize that ESJP is a political group, and their actions were part of a political protest. ESJP, as well as other groups on campus, have a right to political protest. Groups and individuals who criticize them must understand that fact in order to properly confront such protests. What’s more disappointing is that the Emory community allowed itself to be manipulated by outside organizations and individuals with personal agendas. Right-wing media outlets such as the New York Post misreported a rumor that the eviction notices targeted Jewish students. 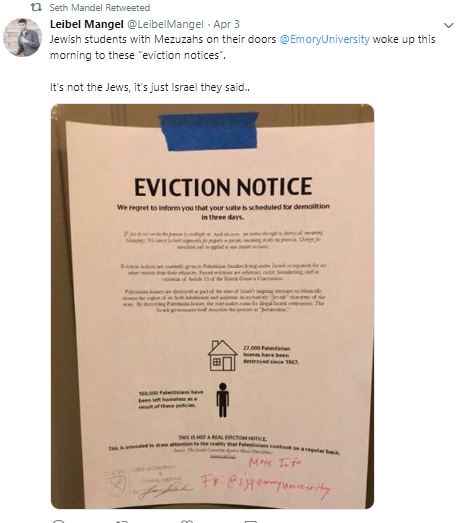 Washington Examiner Executive Editor Seth Mandel shared a tweet claiming that Emory students with a mezuzah, a Jewish symbol, on their doors had woken up to the eviction notices. This tweet misrepresented the fact that students had received notices regardless of their religious affiliation. Some Jewish organizations sensationalized the alleged anti-Semitism of the eviction flyers instead of engaging in thoughtful dialogue. The regional director of the Anti-Defamation League Southeast said that “Emory’s response minimized the true harm of the violation” on April 5, calling the flyers anti-Semitic. Since there is no evidence that the notes were targeted, and the flyers only contained criticism of a foreign government, such claims are unfounded and have given extremism a foot-hold within the Emory community. The opportunistic reactions of partisan media organizations have rallied opposition to students’ right to free speech and protest. Emory must publicly extend the same support it offered students first affected by the notices to ESJP students currently facing harassment. The overreaction to the flyers by both the Emory community and outside organizations minimizes actual anti-Semitic hate crimes. ESJP’s flyer protest, though lacking in tact, was an instance of free speech and an effective protest. It was not an anti-Semitic hate crime. Emory students must be more mature if they wish to legitimately discuss complex international affairs. Students have overlooked the fact that opinions regarding Israeli-Palestinian relations have routinely inflamed the Emory campus in recent years. It would be foolish to assume that similar events will not happen again. Emory students must learn to avoid the traps of misinformation and insularity for the University to become the exemplar of open dialogue it ought to be. The Editorial Board is composed of Zach Ball, Jacob Busch, Ryan Fan, Andrew Kliewer, Madeline Lutwyche, Boris Niyonzima, Omar Obregon-Cuebas, Shreya Pabbaraju, Madison Stephens and Kimia Tabatabaei. Zach Ball previously served as president of Emory Students for Justice in Palestine and recused himself from this piece.